Not all Americans own their home. In fact, more and more of them rent it. More and more of them also end up paying a disproportionate amount of their income for shelter. Despite a system largely biased in favor of homeowners and widespread predatory practice against tenants, Tony Roshan Samara sees recent renters’ mobilizations as an encouraging sign for many poor families throughout the USA. The recession of 2004–2009 ushered in an era of sustained, structural inequality that is fundamentally reshaping the housing landscape in the United States. Increases in homeownership rates made during the two-decade housing bubble evaporated when the market crashed, driving millions of former owners into the rental market. Many will remain there, joining the ranks of an emerging renter class. Renters now make up more than one third of all households across the country with far higher proportions in urban areas, and within low-income communities and communities of color, where they are often majorities (Joint Center on Housing Studies 2013). 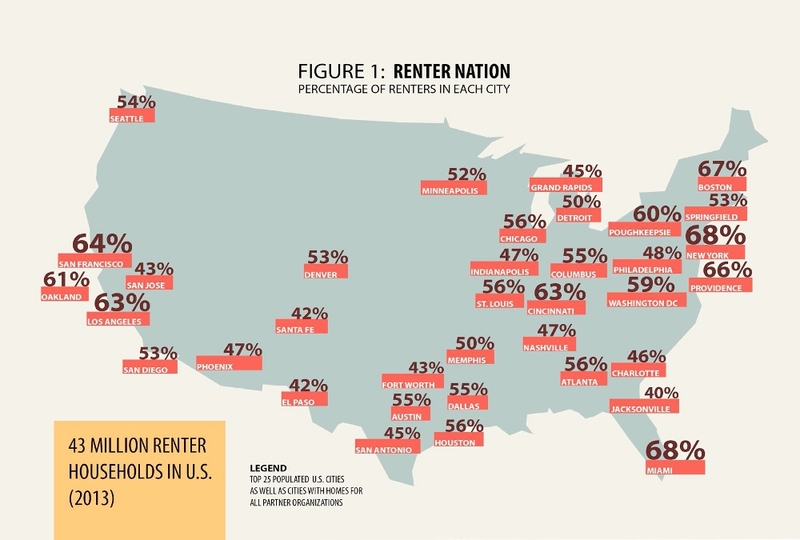 Source: map excerpted from Rise of the Renter Nation: Solutions to the Housing Affordability Crisis, a report by the Homes for All campaign of the Right to the City alliance, June 2014, p. 7. By most estimates, the renter population will only continue to grow in coming decades. This poses major challenges for metropolitan regions, where low-income households are either under constant threat of displacement or have already been displaced to new and existing spaces of neglect and disinvestment. Renters occupy the intersection of housing and inequality, yet they remain marginal to housing policy and to broader debates about the future of housing security. Policymakers continue to push private homeownership as the preferred housing model, continue to treat renters as second-class citizens, and continue to expend massive resources in support of middle- and upper-middle-class homeowners, while low-income renters struggle with a severe shortage of affordable units, crushing rents, and deteriorating housing conditions. Add to this the recent and aggressive entry of predatory financial institutions into the rental market and it becomes clear that the housing crisis is still very much with us, and is increasingly a renters’ crisis (Right to the City Alliance 2014). Throughout the 20th century, private homeownership was encouraged by the federal government, the real-estate industry, and popular culture. Ownership was promoted as the path to financial security and upward mobility in a society where the state’s role in ensuring the general social welfare has always been ambivalent at best. But ownership was also viewed as a moral and political cause. Particularly in the early decades of the century, with revolution abroad and social unrest at home, homeownership gave a man (and by extension, his family) a material stake in American society while conferring middle-class respectability. In short, echoing older forms of exclusionary democracy, homeownership became a marker of the good citizen. Massive spending by the federal government after World War II expanded homeownership substantially and cemented its position at the center of the American Dream. Most of this expansion was among white households. Discriminatory lending practices often made it very difficult for people of color to access financing, and even where they could, they were effectively excluded from buying in many of the new suburbs, owing to resistance by white homeowners. By the 1950s, a majority of whites owned their own homes. The ownership rate underwent small but steady increases during the 1960s and 1970s and then decreased through the 1980s, cycling between approximately 62% and 66% despite unwavering federal support. In the mid-1990s, the speculative bubble began to inflate as policymakers in Washington, DC, responded to Wall Street demands for financial deregulation. The following decade of financial fraud drove the ownership rate to almost 70% on the eve of the collapse in 2004. But by 2012, the rate was back to 65.4%, identical to the rate when the bubble began in 1996. Ownership rates, even at the height of the bubble, never exceeded 50% of black and Latino households, and have historically been well below the halfway mark. For whites, on the other hand, the ownership rate in 2014 is 73%, compared with 43% for blacks and 46% for Hispanics (US Census Bureau News 2014). But the solution to this persistent disparity is not to reorient the housing framework and recruit more historically excluded groups into the homeowners’ club. Even if ongoing racism in the housing market could be overcome, the homeowner approach ignores two related realities: first, even during the Golden Age of the US economy after World War II, the ownership rate never exceeded two thirds of the population, and was concentrated disproportionately among those at the middle and higher income levels; and, second, the ownership model, and the mortgage system at its heart, assumes consistent, decades-long economic growth and, more importantly, rising incomes. Neither of these can be taken for granted, and doing so will only set the stage for continued fraud, wealth concentration, and systemic instability. Instead, moving forward towards genuine housing security requires breaking the financial, political, and ideological stranglehold that private ownership has on how we think about property, community stability, and housing security. This, in turn, requires that we fully understand the nature and extent of the renter crisis. Renters face a perfect storm of rising rents and falling wages, a severe shortage of affordable units, and increased competition as the number of renters grows. Rents have been increasing for the past 20 years and jumped 4% in each of the past two years alone (Abromowitz 2012). Over the period extending from 2000 to 2014, median household income has increased by 25.4%, while rents have increased by over 52.8%, more than twice as much (Rao 2014). Source: chart excerpted from Rise of the Renter Nation: Solutions to the Housing Affordability Crisis, a report by the Homes for All campaign of the Right to the City alliance, June 2014, p. 12. As a result, the number and proportion of renter households facing serious economic hardship because of housing costs continue to climb. Of the 43 million renter households in the US, about half (over 21 million) pay more than 30% of their income in rent, and more than 11 million pay over half. Source: chart excerpted from Rise of the Renter Nation: Solutions to the Housing Affordability Crisis, a report by the Homes for All campaign of the Right to the City alliance, June 2014, p. 14. In a recent and well-publicized study, the New York Times found that in 90 metro regions across the country, rental housing (excluding utilities) is out of reach for even middle-income  households (Dewan 2014). For low-income renters, the picture is even grimmer. A study by the Urban Institute found that, nationwide, there are only 29 affordable units for every 100 extremely low-income renter households. The National Low Income Housing Coalition estimates that 7.1 million additional units of housing are required just to meet the needs of very low-income households (National Low-Income Housing Coalition 2013). These burdens continue to weigh more heavily on people of color and women. In 2011, 51% of renter households (totaling 20.6 million households) were either moderately burdened (with 30% to 50% of income going toward rent) or severely burdened (over 50% of income). However, the figure for white households was 46%, compared with 59% for black households, 57% for Hispanic households, and 48% for Asian households (ibid., p. 47). In 2010, women-headed households represented almost 75% of all renter households receiving assistance from the US Department of Housing and Urban Development (HUD), or 3.2 million households nationwide (Cusack 2012). Housing insecurity for lower-income renters is not a creature of the housing market crash in 2006. Processes of gentrification and displacement stretch back almost three decades to the abandonment of the city in the early 1970s and rise of austerity politics in the 1980s (CJJC 2014). As finance capital began to create new global circuits in the 1970s, urban land markets in previously neglected communities began to revive, as urban economies shifted from manufacturing to services. Investment capital began to return to the city, seeking higher returns during a period of economic stagnation (Harvey 1989). The result was the urban “revitalization” period of the 1990s to the present, which has produced severe socio-economic inequality across metropolitan regions. Rents went up, and many long-term residents were driven out of their communities in a new round of urban renewal. When the recession came, the hardest-hit communities were already reeling from years of neglect and often outright hostility on the part of city governments and more affluent populations. The vulnerability of these communities is directly linked to the steady erosion of protections for renters and the decline of the tenants’ rights movement, both of which occurred just as financial capital was busy discovering urban land as a source of profit and knocking down barriers to the realization of that profit (Ceraso 1999). In Boston, Brookline, and Cambridge, Massachusetts, for example, after rent control was abolished across the state in 1994, rents in gentrifying neighborhoods increased by 50% to 150%, displacing thousands of local residents (PolicyLink 2001). A spokesperson for Boston’s mayor at the time stated that the rent for a two-bedroom apartment had increased by over 75%, and a study by a Cambridge landlord found that rents for previously rent-controlled units had doubled (Temple 2008). The widespread immiseration of renters is pushing us to reconsider how we think about housing politics, and urban politics more broadly. Recognizing the centrality of renters to the struggle for housing security is the first step in reshaping the political terrain upon which current housing policy rests and, in the end, in reshaping the city. While gentrification and displacement have rightly been central to discussions of inequality in the city, the fact that the vast majority of those displaced or at threat of displacement are renters remains an underdeveloped aspect of analytical and political treatments of urban dispossession. As the report released by the Homes for All Campaign shows, renters are slowly re-emerging as a political constituency in itself, as a category of urban citizens, in cities across the country. In this era of globalization, it may be that the local level holds the most potential for renters to begin advancing concrete solutions that will alleviate their everyday burdens, push back against the destructive logic of market fundamentalism, and widen the political space for marginalized populations seeking to reshape the city. The struggle for rent control and just-cause eviction ordinances, for example, can have a direct and immediate effect on renter households in ways that accelerating new construction—a popular approach for pro-market affordable housing advocates—simply cannot. Rent control also directly challenges the logic that views land and homes as profit-generating commodities above all else, and the real-estate industry that benefits from it. Finally, rent control and just-cause eviction protections are essential mechanisms for keeping households in place and communities intact, which, in turn, secures the social relationships and networks that make transformative politics possible (Samara 2014, 2012). Much work remains in overcoming the deep-seated pro-ownership bias in the culture and in policy and creating a dynamic, sustained movement. Homeowners as a constituency continue to dominate politics not only nationally and at the state level, but also at the metropolitan level, where renters are often a marginalized majority. Within the renter population, important differences of race, ethnicity, national origin, and class must be addressed. If, however, cities are to be remade by communities whose needs and desires have historically been ignored, if they are to be reshaped in accordance with principles of justice and not profit, then we must begin the work of building a renters’ movement. Abromowitz, David M. 2012. The Housing Market is Not Only for Homeowners, Washington, DC: Center for American Progress. Causa Justa :: Just Cause (CJJC). 2014. Development without Displacement: Resisting Gentrification in the Bay Area, Oakland, California. Ceraso, Karen. 1999. “Whatever happened to the tenants [sic] movement?”, Shelterforce, no. 105, May/June. Cusack, Tom. 2012. “HUD may not be around later: and the Republicans wonder why they Have a problem with women?”, Oregon Housing Blog, 16 April. Dewan, Shaila. 2014. “In many cities, rent is rising out of reach of middle class”, New York Times, 14 April. Gann, Tom. 2014. “London renters and the right to the city”, New Left Project, 21 February. Harvey, David. 1989. “From managerialism to entrepreneurialism: the transformation in urban governance in late capitalism”, Geografiska Annaler: Series B, Human Geography, vol. 71, no. 1. Joint Center on Housing Studies. 2013. America’s Rental Housing: Evolving Markets and Needs, Cambridge, Massachusetts: Harvard University. National Low-Income Housing Coalition. 2013. Housing Spotlight, vol. 3, no. 1. PolicyLink. 2001. Equitable Development Toolkit: Rent Control. Updated December 2001. Rao, Krishna. 2014. “The rent is too damn high!”, Zillow Real Estate Research, 15 April. Right to the City Alliance. 2014. Rise of the Corporate Landlord: The Institutionalization of the Single-Family Rental Market and Potential Impacts on Renters, New York: Right to the City Alliance. Samara, Tony Roshan. 2012. “Citizens in search of a city: towards a new infrastructure of political belonging”, in Michael Peter Smith and Michael McQuarrie (eds. ), Remaking Urban Citizenship: Organizations, Institutions, and the Right to the City, Edison, New Jersey: Transaction Publishers, pp. 39–56. Samara, Tony Roshan. 2014. “Housing demolition and the right to place”, Polis, 6 January. Temple, James. 2008. “Differing views on measure to end rent control”, San Francisco Chronicle, 7 May. US Census Bureau News. 2014. Residential Vacancies and Homeownership in the Second Quarter 2014, 29 July, Washington, DC: US Department of Commerce. This article is adapted from the report Rise of the Renter Nation: Solutions to the Housing Affordability Crisis published by the Homes for All campaign of the Right to the City alliance. The full report is available for download here: http://homesforall.org/campaign/reports/rise-of-the-renter-nation. Source: Urban Institute, Housing Assistance Matters Initiative. See: www.urban.org/housingaffordability. There are exceptions, of course – see, for example: CJJC 2014; Gann 2014. See the work of the organization Causa Justa :: Just Cause: www.cjjc.org.